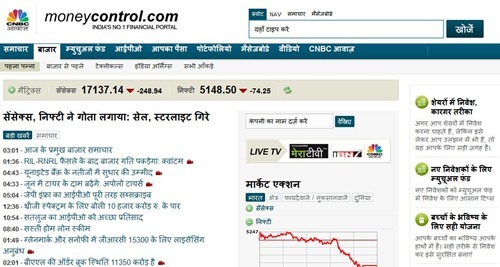 Moneycontrol.com, India’s leading financial portal has goes local with Hindi Language. Hindi site is exact replica of the English version and literally every part that is available in English is available in hindi as well. Especially for the market which moneycontrol caters to, I think it is a great move. 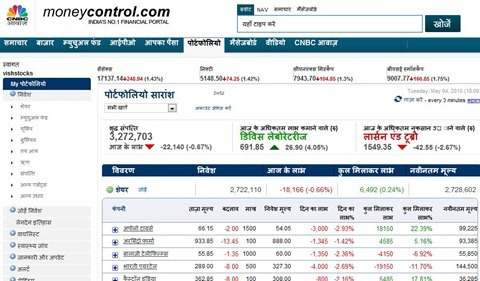 Most of the traders, stock market brokers and retail investors are well versed with Hindi language and now hindi moneycontrol should be quite popular with them. I think the logical next language should be Gujarati given the kind of market it caters to..
From Business perspective as well, it makes a lot of sense – As it is matter of just translating the available English content, the cost of producing it will be much lesser. I am sure hindi version will garner good amount of page-views. Just as a benchmark, Hindi version of Economic times is estimated to have close to 10 million pageviews and I am sure moneycontrol’s hindi site will surpass that kind of traffic. This also is now an extra avenue for direct advertising – Moneycontrol’s main channel of income. Infact, Moneycontrol’s VP sales, Rajan Srinivasan, mentioned to Afaq article that advertisers have already backed them for this. It is not only Moneycontrol, but overall web localization is getting good traction in India. It was announced recently that Internet domains will very soon be available in local languages as well. Already, many content portals like oneindia (which incidentally got acquired today by Netcore) and other Southern local language dailies command respectable traffic sometimes surpassing well known English counterparts. What is your take on localized web growth in India ? <a href="http://www.sharetipsinfo.com&quot; title="SHARETIPSINFO TEAM">SHARETIPSINFO TEAM</a>. YA its a good site.Much preffered and one of the leaders of equity research in our country.Infact I have reviewed about them in my blog too. Did you ever look at your bank account in the end of the month and asked your self , “How did that happend ??? ” . If that question pops up in your mind often, http://www.anigam.com is tailored suit for you. After short registration you’ll start a financial program that based on 3 foundations : 1.Personal responsibility . 2. Self awareness . and 3. Visual presentation. Don’t be skeptical , if it is works for millions all over the world ,it’ll work for you too. Open new account – it’s free.